We summoned it with our malice. We made it grow by the strength of our hatred. We let it stay because we can't change our very natures. Nothing can force humans to commit acts of evil, only endow us with powers to indulge in our own sadistic proclivities. It's all around us, on every news channel and in every paper. The vile nature of man is evident. Some of us kill our parents and forsake our children, greed is our creed and instant gratification our pastime. There is no God; there is no heaven or hell. There is only the ancient darkness and the evil of man. Hope is fleeting and grace is no longer in our grasp. We gave the darkness a form and a realm of its own. It wishes to feed upon us but now some parts of it want more. Humankind has taught it to relish in the suffering of others in a way only humans can. 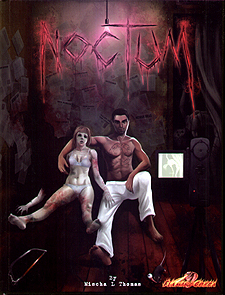 Enter Noctum, an inner tale of survival horror. There is nothing more evil than your fellow man. In this complete role-playing game you will find the following features and much more. * A Fight or Flight monitor and rules to keep track of the characters' fear and adrenaline and the changed stats that go with them. * An in-depth system dealing with mental stress, depression and an array of mental disorders; this includes rules that allow a character skilled in psychology to help or break another individual. * Game mechanics that enable you to play everything from ghastly and suspenseful CSI type investigative conspiracy stories to gritty and dark bullet-time style action scenarios using the Duke Mode. * Cinematic system used to create horror movie type one-shots by employing the 12 Trouble Traits, which guarantee that the characters are drawn into the story and dangerous situations. * Information on serial killers and how to go about profiling them. * Several harrowing weaknesses that define the very characters you play. * Forty-five detailed NPCs and unique minions of darkness. Fill in the blank autopsy reports to create horrific handouts. Illustrating how the victims of these creatures have been slaughtered will surely spice up any horror story. * A staggering amount of information dealing with the game universe and the hidden powers, including detailed information on sixteen cults and organisations. * Information and rules, which let characters possess paranormal and magical abilities, defining black, white, grey and dark magic. This mechanic uses the seven aspects cards in order to determine whether a character keeps his power under control or gives way to his inner demons. * A system that lets you handle curses, possession and stains of evil that may jump from one individual to another by touch alone.